My early January Tongan trip – which ended in the Ha’apai Islands group just before Cyclone Ian arrived – also featured Vava’u, the main island in the Vava’u group. 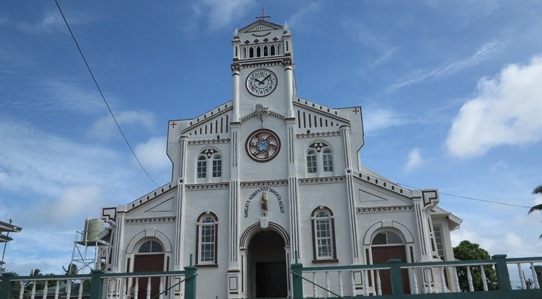 ▲ The picturesque St Joseph’s Cathedral, overlooking Neifau, the island’s main town. Well only town. ▲ Maureen and I arrived in Australia, way back in 1972, on a New Zealand yacht we’d hitched a ride with from Bali. The yacht’s owner (and skipper) David Hunt now lives in Tonga and runs the Moorings yacht charter business. So we had a look around on a Moorings’ catamaran. ◄ And looked around the island on these king sized go-karts. 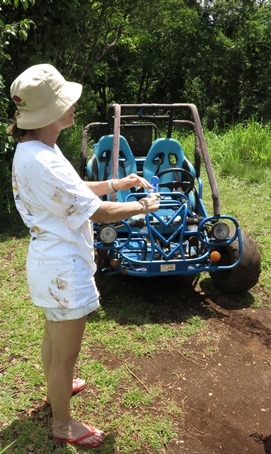 They’re an island attraction and a way to get very muddy on the island’s many dirt tracks. ▲ Lisa on the Fetoko Island beach. We stayed at the Tongan Beach Resort while we were on Vava’u, but also went out to have a look at Ben and Lisa’s Mandala Resort on a tiny island off the main one.